Purpose: The aim of the study was to present the level of knowledge and practice patterns regarding exposure keratopathy in mechanically ventilated patients among Intensive Care Unit (ICU) nurses in Chhattisgarh state. Methods: A previously validated semi-structured questionnaire was administered in the ICU of six multispecialty hospitals in Chhattisgarh in 2014–2015. Demography included age, gender, level of education, and months of working in ICU. Most of the questions dealt with frequency of eyelid closure assessment, frequency of cleaning of eyes with saline gauze, using a protocol-based approach for eye care, and documentation of ophthalmic complications. Common barriers to delivery of eye care such as shortage of time and too much writing tasks were also inquired. Results: Our study included 120 nurses. They worked for mean 22.9 ± 17.8 months in ICU. Knowledge about high risk of exposure keratopathy in ventilated patient was present in 93% (78%; 95% confidence interval [CI]) nurses. Only six nurses (5%) followed a strict protocol for eye care, 52 nurses (43%) checked for eyelid closure in the ventilated patients, and 58 (48%) cleaned the eyes frequently. Those who were aware of exposure keratopathy checked eyelid closure (73% vs. 48%) and cleaned eyes with saline gauze more frequently (24% vs. 4%). Nurses in cardiac ICU were significantly lesser aware of exposure complications compared to medical ICU nurses (40% reduction in awareness, 95% CI = 0.37–0.98, P = 0.04). Conclusion: Although there is high awareness, practice patterns of ICU nurses were less than desired. Educational initiatives should focus on weaknesses in knowledge and practice noted to improve eye care of patients in ICU. The purpose of performing KAP surveys in specific domains such as ICU is to document the levels of knowledge and prevalent practices. This is the first study assessing the knowledge and practice patterns of ICU nurses regarding eye care from India which will help us to formulate the strategy to improve nurse's knowledge. This was a cross-sectional study done to assess the knowledge and practice pattern of ICU nurses on eye care of unconscious mechanically ventilated patients. This study was conducted on a convenience sample of ICU nurses in six multispecialty hospitals of Chhattisgarh state, in and within 250 km of the capital city Raipur in 2014–2015. Only those nurses working in ICU for at least 6 months, having at least 1 year of nursing experience, and willing to participate in the study were included in the study. The study was approved by the Institutional Ethical Committee of the parent institution and informed consent was obtained from all the participating nurses. The study methodology and reporting is compliant with the COREQ guidelines. The nurses were briefed about credentials of the principal investigator (PI) performing the study (SV) and were explained the nature and rationale of the study in a single session in each ICU by the PI. The printed questionnaires were handed out to the nurses by the ICU head nurse in each ICU and were collected back by the end of their shift. Before starting their response, nurses were informed that answering all questions was not mandatory. The semi-structured questionnaire was based on the one published by Güler et al. and was modified in-house for our current study. Questions regarding the barriers to eye care delivery were also incorporated into the questionnaire based on a study published by Mohammadi et al. In the initial phase of questionnaire modification, based on the methodology of content analysis, nurses were asked open-ended questions for about 10–15 min about their eye care practices in the ICU by the PI. Field notes were taken, and the responses, along with input from key members of the ICU patient care team including physicians, senior nurses, and ophthalmologists from one of the participating hospitals, were compiled to create a modified questionnaire. This was administered to a pilot group of thirty nurses. Additional changes were made based on this pilot and were incorporated into the final questionnaire administered to the study participants. The questionnaire appeared to be easily understood and was finalized. The questionnaire was designed in English and translated into the local language (Hindi) by a language expert and then translated back into English to ensure that the meaning of the questions stayed the same. In the final questionnaire, questions were in both languages [Annexure 1] [Additional file 1]. The questionnaire was self-administered, and data were anonymously collected on the age, gender, level of education (diploma vs. degree in nursing), months of working in ICU, type of ICU they are working, and any special training taken for eye care in the past. Most of the questions were in yes/no format and the questions were about the frequency of eyelid closure assessment, frequency of cleaning of eyes with saline gauze, the nurses' beliefs about the goal of eye care, using a protocol-based approach for eye care, and documentation of ophthalmic complications. In addition, a list of ten essential nursing care activities (including tracheal suctioning, skin care, eye care, oral care, bowel care, writing reports, helping or doing personal hygiene for mechanically ventilated patients, care for catheters, nutrition, and preventing sensory overload) was inquired, and the nurses were required to rank these activities 1–10 based on priority of execution, with a higher rank indicating greater priority. Questionnaires were deemed to be incomplete if more than 5 questions were left unanswered by the nurses. Continuous variables were expressed as mean with standard deviation or median with interquartile range (IQR) and group differences were analyzed using the Student's t-test or Wilcoxon rank-sum test. Categorical variables were expressed as proportions, and group differences were analyzed using Chi-square or Fischer's exact test. The sample was divided into two groups using the median of months of experience in the ICU and group differences analyzed. Similarly, group differences between diploma and degree holders and those aware of high risk for ocular surface disease versus not aware were analyzed. Based on the type of ICU nurses were divided into three groups: Medical ICU (MICU) is a unit providing acute care for critically ill medical patients, surgical ICU (SICU) is designated for care of critically ill surgical patients, and cardiac ICU (CICU) is a unit specialized in the care of patients with various cardiac conditions that require continuous monitoring and treatment. Factors influencing awareness of risk of exposure keratopathy were analyzed using logistic regression analysis and expressed as odds ratios with 95% confidence intervals (CIs). All data were entered in excel and analyzed using STATA 12.0 (Stata Corp, Fort worth Texas, USA). P < 0.05 was considered statistically significant. We enrolled 120 nurses working in the ICU setting from six different hospitals during the study period. Responses were submitted by 128 nurses, of which 8 were found to be incomplete and were excluded from the analysis. The mean age of the participants was 25.1 ± 3.8 years (median = 24, IQR = 23–26 years) and 90 were female nurses (75%). Out of the 120, 85 (71%) were working at the MICU, 6 (5%) were at the SICU, and 29 (24%) were at the specialized cardiac care ICU. Sixty nurses (50%) had a diploma in nursing, 50 (42%) had a bachelor's degree, and 10 (8%) had a master's degree in nursing. Participants had an experience of 22.9 ± 17.8 months of working at the ICU (median = 18 months, IQR = 10–29.5 months). Ninety-three nurses (78%) were aware that ventilated patients were at a high risk of exposure keratopathy. Out of them, 58 (63%) were able to enumerate exact nature of eye diseases that could occur on their unconscious patients. Only six nurses (5%) reported following a strict protocol for eye care, 52 nurses (43%) reported checking for eyelid closure in the ventilated patients, and 58 (48%) said that they cleaned the eyes with normal saline gauge. In addition, only 23 nurses reported cleaning eyes every 6 h and 38 (32%) reported instilling lubricating eye drops in those with inadequate eyelid closure. Half the nurses (n = 60) reported using eye tape in patients whose eyes were not closed completely. Thirty-six nurses (30%) reported taking some precaution to protect eyes (such as covering the eyes with gauze) while performing tracheal suction and only ten out of these reported keeping the suction tube away from eye. Overall, only 57 responded (48%) correctly when asked, “why you take care of eyes of patients under mechanical ventilation?” Finally, 49 nurses (41%) said that they did not refer patients to ophthalmologists, 44 (37%) said that they referred patients when required or when prompted by the intensivist at the ICU, 24 (20%) said that they referred to ophthalmologists once every day, and 3 (2.5%) said that they referred once every 3 days. Out of 10 possible activities, 9 nurses (8%) reported performing eye care as the first task. None of the nurses maintained a register to document eye problems encountered in their ICU. 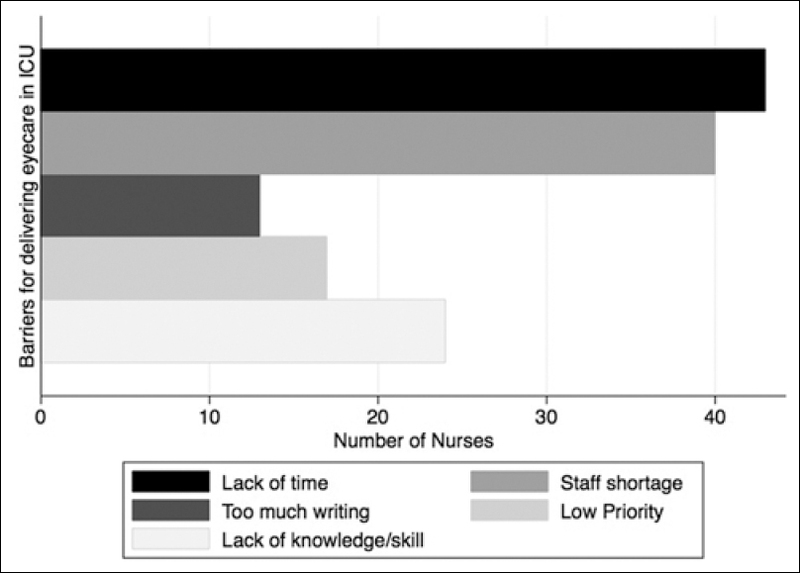 On inquiring barriers faced in the ICU to provide adequate eye care [Figure 1], 36% nurses (n = 43) reported lack of time as the most common barrier. On dividing nurses as per their ICU experience using the median value (18 months), we found that there were significantly more male nurses in the experienced group. There were no differences in the attitude and pattern of delivering eye care in the two groups. However, those with lower experience cited a lack of adequate knowledge and skill about eye care in the ICU setting as a significant barrier for delivering eye care [Table 1]. On comparing those with a diploma versus degree in nursing [Table 2], we again found no significant differences in the attitude and pattern of delivering eye care in the two groups. However, a greater proportion of those with a nursing degree reported a lack of adequate knowledge and skill to deliver eye care. On comparing those nurses aware (n = 93) of risk of exposure versus those unaware (n = 27), we found that [Table 3] those with greater awareness had significantly shorter experience of working in ICU and those working in the MICU had significantly greater awareness, whereas those in the CICU showed lesser awareness. In addition, we found that those who were aware of exposure-related complications check eyelid closure more frequently, greater proportion clean the eyes with saline-soaked gauze, and undertake this task more frequently compared to those who are unaware. 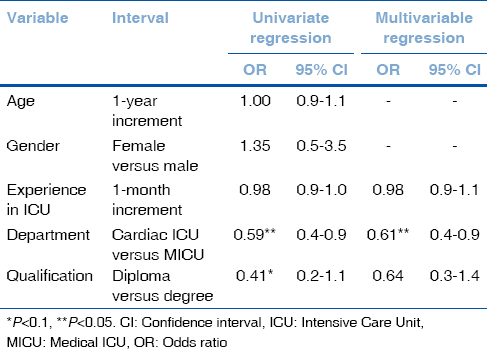 Multivariable logistic regression analysis adjusting for experience and highest qualification, we found that [Table 4] CICU nurses were significantly lesser aware of exposure complications compared to MICU nurses (40% reduction in awareness in CICU nurses versus MICU nurses, 95% CI = 0.37–0.98, P = 0.042). Three-fourth of participating nurses were aware of exposure keratopathy and its associated sequelae in this cohort of nurses. However, almost none follow a protocol-based approach. Overall, only half the nurses checked eyelid closure and cleaned eyes with saline gauze and very few did it 6 hourly. However, those aware of the risk performed better in most parameters compared to those who were unaware. CICU nurses demonstrated least awareness. Finally, very few routinely referred their patients for ophthalmology consults and very few gave eye care the first priority while managing the comorbidities of their patients. It was encouraging that, in a tier two city like Raipur, less than a quarter nurses responded by saying that they were unaware of the high potential for exposure keratopathy. However, the fact that only about 50% nurses checked eyelid closure and took steps to prevent exposure keratopathy as well as the lack of a protocol-based approach to eye care delivery suggests that the knowledge of risk has not influenced practice patterns of these nurses. Oh et al. reported similar responses from a survey conducted in Korean nurses where only 42% reported providing eye care for their mechanically ventilated patients on a routine basis. Güler et al. have reported higher proportions from Turkey and Palestine (70% overall). Hence, we find a lot of variability in the practice patterns of nurses across the globe, despite the heightened knowledge. Those with awareness about exposure keratopathy checked eyelid closure more frequently, instilled lubricant drops, and cleaned eyes with saline-soaked gauze more frequently than those without awareness. This signifies that improving awareness in nurses may lead to improved eye care delivery in comatose patients on mechanical ventilation. Demirel et al. described a simple and easy eye care protocol, including eye cleaning with saline, application of topical antibiotic or lubricant, and closing the eyes with vertical thin adhesive tape in detected cases of lagophthalmos. For proper follow-up in lagophthalmos, the authors emphasized that the eye should not be covered with a sponge and the blink reflex should be followed routinely. They trained 260 ICU nurses on this protocol and found a significant reduction in the rates of exposure keratopathy in the subsequent period posttraining. Similarly, Fashafsheh et al. also described a checklist-based approach in 35 nurses and found a statistically significant difference in the total knowledge scores regarding eye care of unconscious mechanically ventilated patients. Hence, creating protocols and checklists can improve the nurse's knowledge and influence their practices to improve eye care delivery. We found some important barriers in delivering eye care in our ICU settings. Whereas lack of time was the most common barrier cited, shortage of trained workforce and lack of adequate knowledge and skill were also cited commonly by the participating nurses. Cunningham and Gould  concluded that patients would benefit from the implementation and audit of guidelines for eye care, but before these innovations are undertaken, barriers to good practice should be explored in ICUs. With knowledge of these operational barriers, we can design strategies to better utilize the time of nurses so that more time is made available for patient care in general and eye care in particular. As highlighted before, providing a structured training program may also help nurses perform better with respect to eye care. We found that nurses in the CICU had much lower levels of knowledge and awareness regarding increased risk of exposure keratopathy compared to nurses in the MICU. The experience in the ICU and the type of degree did not influence awareness levels significantly. It is possible that CICU nurses are extremely focused on the cardiac status of their mechanically ventilated patients and thus are not concentrating on the eye health of their patients. It may be prudent to focus attention and increase awareness among this subgroup of nurses. Indeed, nurses in specialty ICU settings may be less aware about eye care than those in general MICU settings. It would be interesting to explore this hypothesis further and compare the KAP results among general and specialty ICU nurses. The limitations of the study are the use of a semi-structured questionnaire. Recently, a structured questionnaire with psychometric analysis has been published for this purpose and future authors would do well to use this. Lack of data on the incidence of exposure keratopathy in the participating ICUs is another limitation. The strength of the study was the participation of a relatively large number of nurses. To the best of our knowledge, this is the first such study assessing the knowledge and practice patterns of ICU nurses regarding eye care from India. 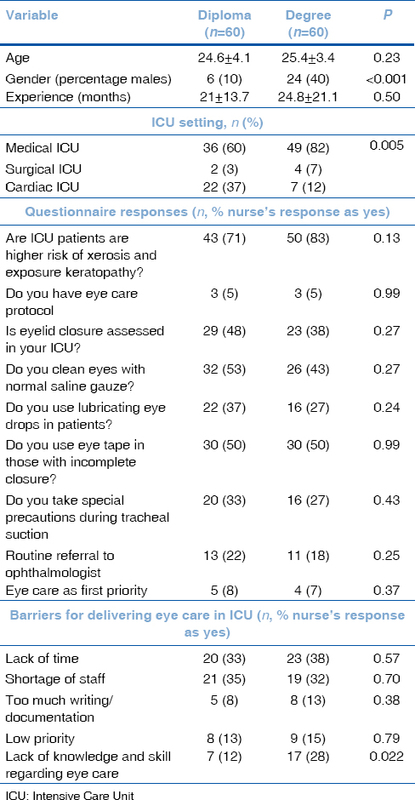 The awareness about the risk of exposure keratopathy is quite high in ICU nurses in our settings. Greater awareness translates into marginally better practices, but we find that knowledge of risk has not influenced practice patterns to make significant clinical impacts. Simple educational initiatives and awareness programs coupled with a protocol-based approach are required to improve the knowledge of nurses in our settings. CICU nurses and probably specialty ICU nurses should be targeted the most as they lack sufficient knowledge and have poor practice patterns toward eye care. Dr. Sabyasachi Sengupta at Senguptas research academy for assistance with data analysis and manuscript writing. Shahin ES, Dassen T, Halfens RJ. Pressure ulcer prevalence and incidence in intensive care patients: A literature review. Nurs Crit Care 2008;13:71-9. McHugh J, Alexander P, Kalhoro A, Ionides A. Screening for ocular surface disease in the Intensive Care Unit. Eye (Lond) 2008;22:1465-8. Rosenberg JB, Eisen LA. Eye care in the Intensive Care Unit: Narrative review and meta-analysis. Crit Care Med 2008;36:3151-5. Grixti A, Sadri M, Edgar J, Datta AV. Common ocular surface disorders in patients in Intensive Care Units. Ocul Surf 2012;10:26-42. Zhou Y, Liu J, Cui Y, Zhu H, Lu Z. Moisture chamber versus lubrication for corneal protection in critically ill patients: A meta-analysis. Cornea 2014;33:1179-85. Cunningham C, Gould D. Eyecare for the sedated patient undergoing mechanical ventilation: The use of evidence-based care. Int J Nurs Stud 1998;35:32-40. Kalhori RP, Ehsani S, Daneshgar F, Ashtarian H, Rezaei M. Different nursing care methods for prevention of keratopathy among Intensive Care Unit patients. Glob J Health Sci 2015;8:212-7. Alansari MA, Hijazi MH, Maghrabi KA. Making a difference in eye care of the critically ill patients. J Intensive Care Med 2015;30:311-7. Fulbrook P, Albarran JW, Baktoft B, Sidebottom B. A survey of European intensive care nurses' knowledge levels. Int J Nurs Stud 2012;49:191-200. Oh EG, Chu SH, Ko IS, Lee WH, Yoo JS, Kim SS, et al. Knowledge, perception & practice of eye care nursing among nurses in Intensive Care Units. J Korean Acad Fundam Nurs 2007;14:437. Cho OH, Yoo YS, Yun SH, Hwang KH. Development and validation of an eye care educational programme for Intensive Care Unit nurses. J Clin Nurs 2017;26:2073-82. Demirel S, Cumurcu T, Fırat P, Aydogan MS, Doğanay S. Effective management of exposure keratopathy developed in Intensive Care Units: The impact of an evidence based eye care education programme. Intensive Crit Care Nurs 2014;30:38-44. Fashafsheh IH, Morsy WM, Ismaeel MS, Alkaiasi E. Impact of A designed eye care protocol on nurses knowledge, practices and on eye health status of unconscious mechanically ventilated patients at North Palestine hospitals. J Educ Pract 2013;4:107-20. Kocaçal Güler E, Eşer İ, Eğrilmez S. Nurses can play an active role in the early diagnosis of exposure keratopathy in intensive care patients. Jpn J Nurs Sci 2018;15:31-8. Tong A, Sainsbury P, Craig J. Consolidated criteria for reporting qualitative research (COREQ): A 32-item checklist for interviews and focus groups. Int J Qual Health Care 2007;19:349-57. Güler EK, Eşer İ, Fashafsheh IH. Intensive care nurses' views and practices for eye care: An international comparison. Clin Nurs Res 2017;26:504-24. Mohammadi M, Mazloumi A, Kazemi Z, Zeraati H. Evaluation of mental workload among ICU ward's nurses. Health Promot Perspect 2015;5:280-7. Ebadi A, Saeid Y, Ashrafi S, Taheri-Kharameh Z. Development and psychometric evaluation of a questionnaire on nurses' clinical competence eye care in Intensive Care Unit patients. Nurs Crit Care 2017;22:169-75.